Through the chivalrous' tons of the chromatic alternation and the aesthetic harmony of Mt. Olympus, the visitor joins the natural beauty meandering at the mythical paths of the great mountain. Meet at the village of Litochoro, at the foothills of Mt. Olympus, with our English - Speaking Guide. You will have a prompt presentation of the program and share info regarding the extraordinary National Park of Mt. Olympus. Your guide will drive you up to “Prionia” Location (1.100m) where you will start descending the last part of the Great Mountain, the entrancing Ennipeas’ Valley. According to the Greek mythology the 7 Muses were bathing their hair in Ennipeas river. 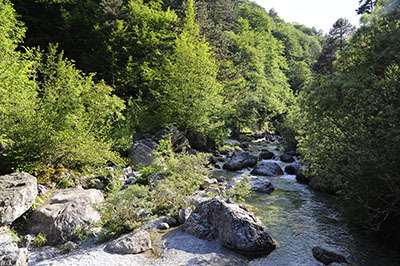 You hike on a capacious path covering a distance of 7,5km till Litochoro village.